MIXiii Biomed Israel is pleased to celebrate the 17th opening of the International Life sciences & Technology Conference and Exhibition in 2018 with a conference and ribbon cutting ceremony. The event is open to the public (registration is required) and provides an opportunity for members of the community to see the new, state-of-the-art advances. We’re Kenes Exhibitions, organizer of the leading Israeli events with a 60-year legacy of serving the medical representatives, researchers, scientists and leaders in the medical field of Israel and abroad. With our academic colleagues, including Johns Hopkins School of Medicine, Northwestern University, Ben-Gurion University of Negev, Hebrew University of Jerusalem and Tel-Aviv Medical University, Israel Biotech Fund, and many organizations in the field of innovations Israel Advanced Technology Industries (IATI), Israel Innovation Authority, we are training the next generations of healthcare professionals and leading researchers to find tomorrow’s cures and treatments. From expert primary care and the widest variety of specialty care, from innovations and technologies in the medical field to cutting edge emergency care, Biomed 2018 offers a wide range of healthcare knowledge of services, diagnostic equipment, latest innovations and biomedical technologies. 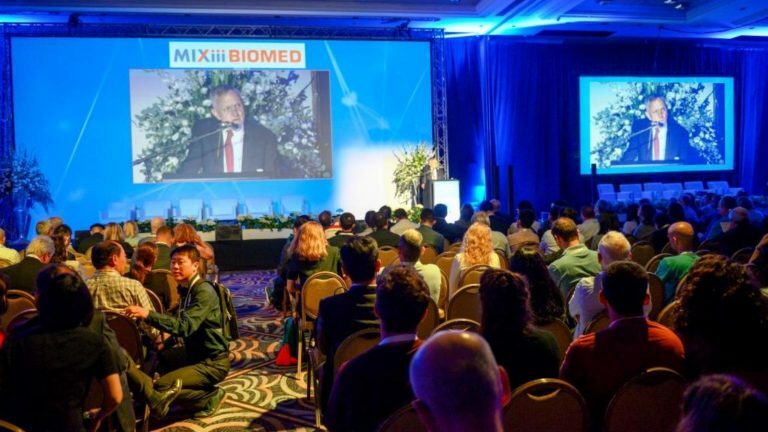 MIXiii-Biomed 2018 is hosting more than 6 thousand participants from 45 countries including global technology leaders in crafting innovative optic and digital solutions for medical and surgical procedures, hospitals and clinics (Mayo Clinic, Cleveland Clinic, Rambam Health Campus, Sourasky Medical Center, Adasa Clinic and Tel Ha-Shomer). There are 45 start-up companies, competing in fields such as rare genetic diseases and medical devices. From the 45 start-ups, 10 companies will be selected by the Innovation Authority, to present during the conference on Wednesday 16 May in Hall D. The winner will be announced in the 1st plenary session on Thursday 17 May. Dignitaries who gathered for the grand opening celebration on May 15, 2018 included chairs from the academic fields and leaders from the biomedical Israeli companies. The celebration featured remarks from Biomed executives, and Conference Chaipersons Ruti Alon, Founder and CEO of Medstrada, Ora Dar, PhD, Israel Innovation Authority and Nissim Darvish, MD, PHD, Senior Managing Director, OrbiMed . Today’s social evening event is the MIXiii-Biomed Gala ceremony—a custom for celebrating the new technology era in the Israel life science area. The extensive Conference program includes 9 tracks each day. The first day of the conference (15.05.2018) is dedicated on the oncology & fighting rare diseases: next generation oncology treatments, immune oncology, general oncology and precision medicine in the oncology; fighting rare diseases using Novel therapeutic approaches and the newest technologies to accelerate drug development. Don’t miss the chance to get more knowledge on Nanomedicine and its Role in New Medical Therapeutics, Future promises of the Nanomedicine and Up-Scaling challenges and be surprised by the new Start-up inventions on May 16. The rest of the tracks are based on the ophthalmology and its part in the medicine, the cutting edge medical devices and technologies. Join us for the Start-up Contest and be one of the first to find out who will win the Biomed 2018 prize for innovation. Be prepared for even more exciting techniques during the Day 3 – learn more about digital health, IoT and Big Data, AI and Cyber – those are the new instruments of the medicine and our era. The Last, but not the less important is the Brain Health session and personalized diagnostics and treatments. Alongside the Biomed 2018 Conference and Exhibition are satellite events of the major companies on the Israeli medical market. Don’t miss the opportunity to enjoy the workshops, symposiums, round tables and receptions by STC , J&J, Lonza, ZAG-S&W in cooperation with IATI, BTG Ferring, Joint satellite event by Sagol School of Neuroscience, Blavatnik Center for Drug Discovery and Prize4Life. Biomed’s medical business event generates more than 75% of the life science’s new inventions for the Israeli market and develops unparalleled medical equipment that empowers healthcare professionals to more easily and effectively diagnose and treat diseases. Israel’s life sciences industry has experienced a 81% growth over the past decade, with around 130 companies founded every year on average, according to a new report produced by IATI, though half of that number ceased to operate. Most of the industry’s employees are divided between its largest companies, meaning 65% of Israel-based life science companies employ 10 people or less. Biomed is one of the most important places for finding a sponsor, investor or a partner ,especially for the start-up companies in Israel or signing agreements and joint-venture partnerships between the leaders in the field. WE ARE WAITING TO MEET YOU FOR NEW AND MORE EXCITING SESSIONS IN THE FIELD OF BIOMEDICINE! JOIN US AT BIOMED 2018 TOMORROW!